Specifications for the 2020 BMW M3 have finally been confirmed. There have been plenty of rumors about the new M3, but BMW hasn’t confirmed any official specification details. Until now, that is. BMW M’s head of product planning, Carsten Pries, recently spoke with Evo to reveal some juicy new information about BMW’s upcoming sports sedan. Unsurprisingly, the new M3 will be powered by the same newly developed 3.0-liter straight-six engine seen in the X3 M and X4 M that debuted last month. In the base version, the S58 engine will pump out 473 horsepower and 442 lb-ft of torque, matching the output of the two performance crossovers. 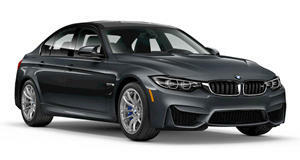 The more powerful M3 Competition, on the other hand, will pack 503 hp and the same amount of torque as the regular model. Once again, this output matches the X3 M and X4 M Competition models. Unlike the X3 M and X4 M, the new M3’s XDrive system will also get a rear-wheel-drive mode borrowed from the M5, allowing you to send power to the rear wheels at the press of a button if you're in the mood for some tail-sliding fun. It will also inherit its bigger brother’s electronic steering system but recalibrated for the lower curb weight of the M3. According to Evo, the new M3 is expected to tip the scales at around 3,527 pounds, whereas an M5 Competition weighs a hefty 4,370 lbs. The new M3 will also borrow the active damper system from the M5. Like the X3 M and X4 M, the M3’s brakes will come with four-piston calipers at the front with a 395mm disc as standard, along with an optional carbon-ceramic setup. 19- and 20-inch wheel options will be available, while Michelin Pilot Sport 4 S tires will be offered as standard. To keep purists happy, an M3 CS could also be offered with rear-wheel-drive only and a manual gearbox, but this model hasn’t been confirmed yet. The new M3 will make its world debut in September at the 2019 Frankfurt Motor Show, but we’re expecting it to break cover online a few weeks earlier.